Greetings in the name of our lord Jesus Christ. I hope that god has helped you in casting away your old to get the new in your life by his grace and mercy. But I am sure there are still a lot of people who may have tried to get over with the past failures, past sorrows but the sorrows and pain are so deep that it just seems to be like an impossible one. Situations where in if anyone has lost their beloved ones is surely a deep pain and loss. And in this post, I would like to help such people to overcome their dreadful condition through the word of god. We can toil and can get the lost wealth and any material possessions but not life. That is why Jesus had to come to this world to conquer the death and through salvation we have the privilege to spend the eternity with our lord Jesus Christ. When the first Adam disobeyed sin and curse entered into the world (Gen3:17-19) in the painful form of death and hence the pain and sorrows. But everything in this world works according to seasons. It is the seasons of time. 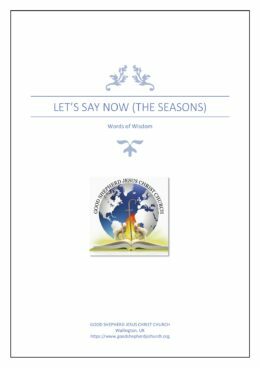 Ecclesiastes chapter 3 verses one to eight describes about the various seasons that a man goes through. And every man is in any phase of that season now. If you are in the seasons of tears, then don’t worry you are sure to have a season of joy (Ecc3:4). Jesus himself went into these phases. He was praised and acclaimed and glorified by the people for a time and there came a time where the same people rejected him. He was thronged by hundreds of people for a time and there a came a time where his own disciples left him. There was a time where multitudes came after him to get healing and to listen to his sermons and then there came a time where none of them were there when he was crucified. He was all alone. Jesus went through all the agony that a man goes through in this world. How would you feel when someone who loved you most hates you? It would be unbearable, isn’t it? And that’s why we see and hear people committing suicide when they fail in their relationship. That’s the kind of thing Jesus went through on the cross. The almighty god too had to leave him as he carried the sins of all humanity. He who knew no sin was made as sin and gods anger was poured on the cross. The agony that Jesus went through was more than ours. It is not only to deliver us from sin and curse but as a role model for each and every one of us to conquer this worlds pain and adversaries. As Paul says we are more than conquerors through him that loved us (Rom8:37) and nothing can separate us from the love of god (Rom8:35; Rom8:38,39). Yes, nothing can separate you from the love of god. So don’t let any of your pain to stop you in your spiritual journey with Jesus. Jesus himself will strengthen you in whatever seasons you are in. But “now” is the time. It’s not later or tomorrow for god has promised that he wants to bless you, heal you, deliver you “now” and right now it shall spring forth (Isaiah43:19). So, rejoice in the lord who changes the time and seasons (Dan2:21).